One of my favorite things about Halloween is when you can invent “new” names for food. 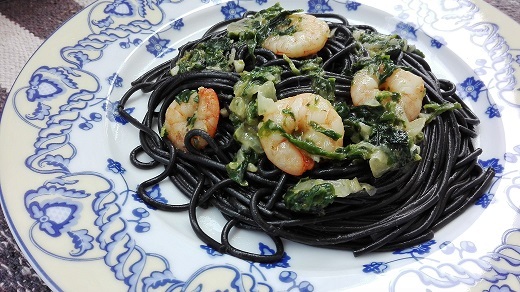 In this case I wanted to use vampire blood, zombie brains and orc meat…so I made this Halloween recipe for monster pasta! 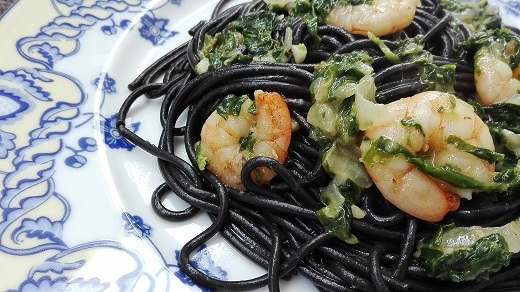 For vampire blood we have the black pasta, which is made with squid ink. What can resemble like zombie brain? Shrimp, of course! And for orc meat? Spinach! And everything put together you will have a super yummy and healthy pasta dish to comfort you. Let’s start making this monster pasta! Start by boiling your pasta according to the package instructions. In the meantime, grab a skillet and add the olive oil and onion, then take it to medium high heat. Saute the onions for a couple of minutes, then add the garlic. After 1 to 2 minutes, add the shrimp. After 3 more minutes, add the spinach. Season with salt and pepper. After 5 to 7 minutes add the butter to finish. Your pasta should be ready by now so drain it and then keep it in the pot you boiled it in. Add what we cooked in the skillet, mixing it through the pasta. And you are done! How easy was that Halloween recipe? Those monsters aren’t that difficult to handle, after all!